Acrimony – a riveting look at toxic fury and the poisonous consequences when it seeps through the veins of a marriage. 27 March 2018 by Daniel Dercksen·Comments Off on Acrimony – a riveting look at toxic fury and the poisonous consequences when it seeps through the veins of a marriage. It’s a great date movie because it takes you on a rollercoaster ride of love, romance, heartbreak and betrayal. Love and fury. Few marriages in history have survived without at least some simmering hostilities and irritating offenses. What happens when a long-suffering wife’s love turns acrimonious? This is the mesmerizing portrait that writer-director Tyler Perry and actress Taraji P. Henson create with Acrimony’s Melinda, a smart, dynamic, loving woman who has always devoted herself to what she believes is right … but is overtaken by a primal need for payback when she feels she has been wronged. In Acrimony, a faithful wife (Taraji P. Henson) tired of standing by her devious husband (Lyriq Bent) is enraged when it becomes clear she has been betrayed. When Melinda (Henson) first met Robert (Bent), she was skeptical of his charming nature but couldn’t deny how attracted she was to him. Once they fell in love, Melinda molded herself into everything he wanted her to be. She sacrificed for him, worked to support his grandiose dreams, and put up with him for better or for worse. Then one day she realized that after all she had done, another woman was reaping the lavish rewards. That’s when Melinda lost it. And now she cannot let it go. She’s been used, disrespected and unpardonably deceived. Or has she? Though Perry is renowned for building a sprawling entertainment empire that spans movies, TV series and plays—and for creating one of the most successful comic franchises of all time (the Madea movies)—the story of Acrimony emerged in a different way for him. Perry starts his story with Melinda in court being sentenced to therapy. Visibly still seething with fury in the counselor’s office, Melinda recounts the tale that has brought her to a criminal crossroads. But is her story even reliable? As Melinda tells it, she and Robert met in the middle of a drenching rainstorm that set the tone for their lives. Despite a courtship that is nearly torpedoed, Melinda puts her unshakable faith in this man and his out-sized, definitely chancy dream to be a culture-disrupting tech inventor. “Melinda and Robert start with a bang and they end with a bang. But in the beginning, they are two young people who love each other very much and would do anything for each other,” says Perry. They come through several big tests, including a future-altering injury, the revelation that Robert was a teen felon who will forever struggle to be hired, and his year-after-year-after-year failure to get his revolutionary rechargeable battery off the ground. Without children, success or even the necessary means to make the mortgage on the home her mother left her, doubts begin to creep into Melinda’s mind. “She’s worked and worked and supported Robert in trying to pursue his dream. But his dream hasn’t happened, and she gets tired of it,” Perry explains. Still, Melinda endures. But there is one thing Melinda has never been able to abide since she was a young woman staking out her independence: that suffocating feeling that someone is taking advantage of her. It makes her go off like a bomb. Pushed by her outspoken sisters, Melinda starts to believe Robert has indeed taken advantage of her, even if the truth is more complex than she can see through the red-hot haze. Perry’s approach to the script was to make it personal to the audience, to spark debate over what went wrong, who was to blame and why Melinda spins out of control. While the story incorporates some of Perry’s most deeply-cherished themes – family, faith and forgiveness—it also plays with how we perceive even those we love most through a veil of past and present grievances. The soundtrack to Melinda’s inner life is the music of legendary soul icon Nina Simone, who poured her brooding heart and demons into songs of unmatched heartbreak and intensity. Though Robert introduces Melinda to Simone, Perry felt Simone was a dead match for Melinda’s psyche. “While writing the script I was listening to Nina a lot and hearing the agony in her voice, I felt it was like a musical extension of Melinda. Nina to me was the sound of what plays in Melinda’s head,” Perry explains. Ultimately, Perry hopes the film gets people talking about Melinda’s perilous path, but also about when people should and shouldn’t trust and forgive. “I think it’s a great date movie because it takes you on a rollercoaster ride of love, romance, heartbreak and betrayal. You take a journey through the good, the bad and the ugly of what any love relationship could be, and maybe it starts a conversation about trust,” Perry concludes. 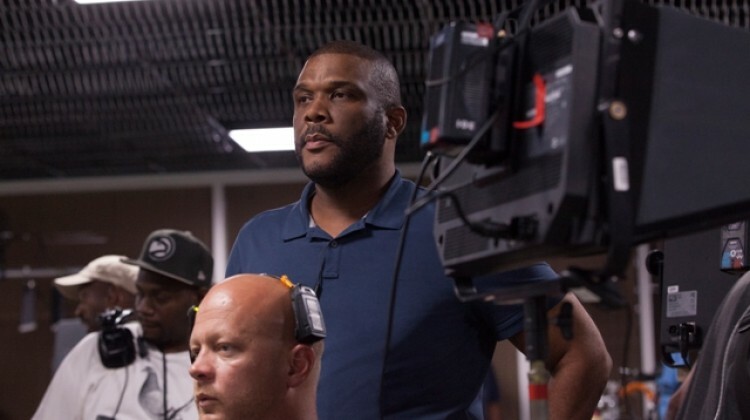 Tyler Perry’s inspirational journey from the hard streets of New Orleans to the heights of Hollywood’s A-list is the stuff of American legend. Born into poverty and raised in a household scarred by abuse, Perry fought from a young age to find the strength, faith and perseverance that would later form the foundations of his much-acclaimed plays, films, books and shows. It was a simple piece of advice from Oprah Winfrey that set Perry’s career in motion. Encouraged to keep a diary of his daily thoughts and experiences, he began writing a series of soul-searching letters to himself. The letters, full of pain and in time, forgiveness, became a healing catharsis. His writing inspired a musical, I Know I’ve Been Changed, and in 1992, Perry gathered his life’s savings in hopes of staging it for sold out crowds. He spent all the money but the people never came, and Perry once again came face to face with the poverty that had plagued his youth. He spent months sleeping in seedy motels and his car but his faith – in God and, in turn, himself – only got stronger. He forged a powerful relationship with the church, and kept writing. In 1998 his perseverance paid off and a promoter booked I Know I’ve Been Changed for a limited run at a local church-turned-theatre. This time, the community came out in droves, and soon the musical moved to Atlanta’s prestigious Fox Theatre. Tyler Perry never looked back. And so began an incredible run of 13 plays in as many years, including Woman Thou Art Loosed!, a celebrated collaboration with the prominent Dallas pastor T.D. Jakes. In the year 2000, I Can Do Bad All By Myself marked the first appearance of the now-legendary Madea. The God-fearing, gun-toting, pot-smoking, loud-mouthed grandmother, Madea, was played by Perry himself. Madea was such a resounding success, she soon spawned a series of plays – Madea’s Family Reunion (2002), Madea’s Class Reunion (2003), Madea Goes To Jail (2005) – and set the stage for Perry’s jump to the big screen. In 2015 Perry returned to the stage, performing his new original play, Madea on the Run, to sold out audiences across the United States. In early 2005, Perry’s first feature film, Diary of a Mad Black Woman, debuted at number one nationwide. His ensuing films, Madea’s Family Reunion, Daddy’s Little Girls, Why Did I Get Married?, Meet The Browns, The Family That Preys, I Can Do Bad All by Myself, Why Did I Get Married Too?, For Colored Girls, Madea’s Big, Happy Family, Good Deeds and Madea’s Witness Protection have all been met with massive commercial success, delighting audiences across America and around the world. He also starred in the Rob Cohen directed Alex Cross and helped release Academy Award-nominated Precious, a movie based on the novel Push by Sapphire, in conjunction with his 34th Street Films banner, Oprah Winfrey’s Harpo Films and Lionsgate. 2006 saw the publication of Perry’s first book, Don’t Make A Black Woman Take Off Her Earrings: Madea’s Uninhibited Commentaries On Life And Love, which shot to the top of the New York Times nonfiction bestseller list and remained there for eight weeks. It went on to claim Quill Book Awards for both “Humor” and “Book of the Year” (an unheard-of feat for a first-time author), and spread Tyler Perry’s unique brand of inspirational entertainment to a devoted new audience. It is a brand that quickly became an empire. In 2007, Perry expanded his reach to television with the TBS series House of Payne, the highest-rated first-run syndicated cable show of all time, which went into syndication after only a year. His follow up effort, Meet the Browns, was the second highest debut ever on cable – after House of Payne. In late 2012, Perry teamed up with Oprah Winfrey in an exclusive deal to bring scripted programming to her cable network, OWN, and launched with the half hour sitcom, Love Thy Neighbor, and the hour-long drama, The Haves and The Have Nots, which made its debut in 2013 and has continued to break ratings on the network. This past summer, Perry debuted a new drama series called Too Close to Home on TLC, the network’s first scripted series. OWN recently announced that they would be premiering a House of Payne spinoff series, The Paynes, on the network in 2018. It was also recently announced that Perry signed a multi-year content partnership with Viacom, in which he will produce original drama and comedy series across the Viacom networks, in addition to having a first-look feature film deal with Paramount Pictures group. In the fall of 2008, Perry opened his 200,000 square foot Studio in Atlanta, situated on the former Delta Airlines campus in the Greenbriar area of southwest Atlanta. During the course of its operation, the space was home to production of over 15 films and over 800 episodes of Perry’s five television series. In 2015 TPS announced plans to expand operations with the acquisition of Fort McPherson, which sits on over 330 acres. Perry and the studio’s Atlanta-based employees will remain in production of Perry’s five current television series, in addition to major feature films and television shows filming in Atlanta. Production is already underway at the new studio, which will contain twelve soundstages ranging in size between 10,000 and 60,000 square feet. But listen to Tyler Perry and you’ll hear a man who hasn’t forgotten about the people that have helped him reach the top of a mountain he could once only dream of climbing. He has been intimately involved and donated generously to civil rights causes through work with the NAACP and NAN. He also strongly supports charities that focus on helping the homeless, such as Global Medical Relief Fund, Charity Water, Feeding America, Covenant House, Hosea Feed the Hungry, Project Adventure, and Perry Place – a 20-home community that Perry built for survivors of Hurricane Katrina in New Orleans. In January 2010, Perry pledged $1,000,000 via The Tyler Perry Foundation to help rebuild the lives of those affected by the earthquakes in Haiti.